Dublin's Christchurch Cathedral at Christmas. CHRISTMAS is the most magical time of year in Ireland, where the festive atmosphere is not to be missed. Cheerful Christmas markets spring up all across the island, traditional decoration displays are top class, and bars are bustling. Family and friends are reuniting by the crackling peat fires with a hot toddy or creamy pint. This is the perfect time of year for friends, both old and new, to visit and savor the joyous season in the Emerald Isle. No matter what part of Ireland you visit, the Christmas markets thrive as locals and visitors alike gather to enjoy a day of shopping, browsing homemade Irish crafts, drinking mulled wine, eating mince pies, and listening to carols. With fun attractions for kids, festive music carrying in the wind, and fairy lights glistening, the Christmas markets have been a thriving recent tradition. Dublin’s New Year’s Festival is getting bigger and better every year as well, with two days of cultural events, live performances, and activities day and night. Ring in the New Year in Ireland’s capital, where the landmarks are transformed with spectacular light shows, and the streets come alive with pop-up performances, and high-flying acrobatics, and so much more? Christmas is a special time to visit, but there is so much to see and do in Ireland year-round. Here we put a spotlight on Ireland’s incredible cities for your 2018 vacation. 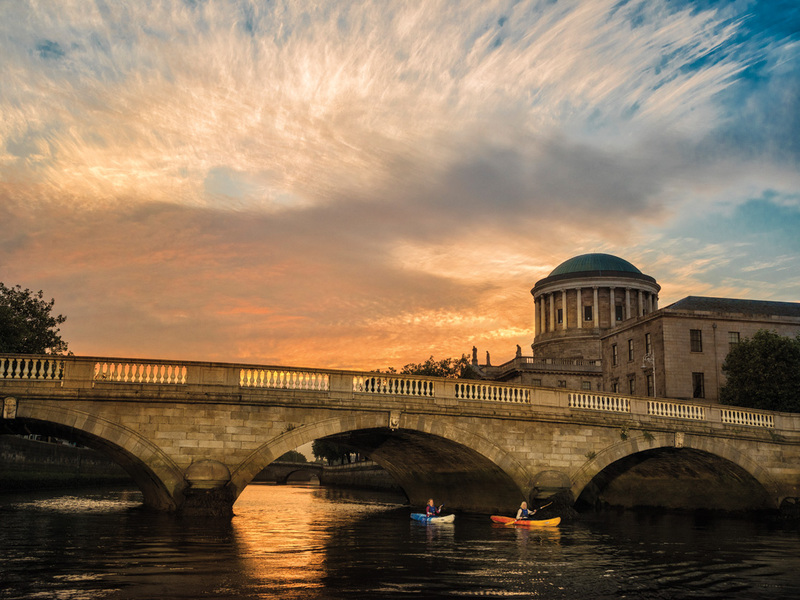 Kayaking by the Four Courts on the River Liffey in Dublin. Named among the 21 Best Places to visit in 2018 by National Geographic Traveler, Dublin offers something for everyone. Along with many cultural aspects, it is a city brimming with historical sites, such as the GPO (General Post Office), castles, national museums, and the former prison Kilmainham Gaol. One cannot leave the city before visiting one of its iconic landmarks. Also not to be missed is the opportunity to take a stroll through the city parks, or see the wild deer walking through Phoenix Park on the way to Dublin Zoo. Trinity College is one of the oldest universities in Europe. A charming campus founded in 1592 it is located on College Green, opposite the historic Irish Houses of Parliament. Many well known alumni have come from here, including poet and playwright Oscar Wilde; satirist, essayist, and poet Jonathan Swift; and author Bram Stoker, best known for his Gothic novel Dracula. The Long Room Library, Trinity College, Dublin. 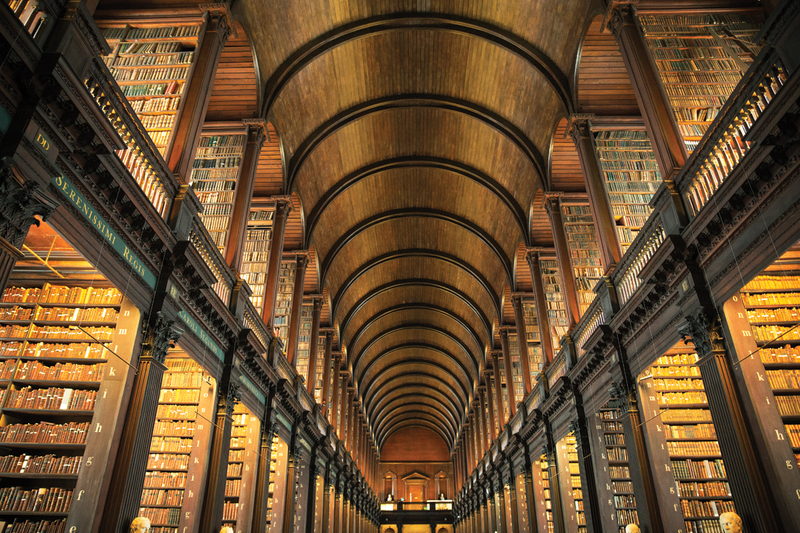 A trip to Trinity College allows you to experience a unique Irish treasure – the Long Room Library. This impressive library holds over 200,000 of Trinity’s oldest books, including a rare copy of the 1916 Proclamation, but most famously, the Book of Kells. The Book of Kells, an early Christian illuminated manuscript created by Celtic monks some time around the ninth century, is a masterwork of Western calligraphy which contains the four gospels of New Testament (Matthew, Mark, Luke, and John) along with rich and colorful illustrations of humans, animals, and mythical beasts, together with Celtic knots. Lonely Planet named Belfast and the Causeway Coast as its number one region to visit in 2018, calling the city “the epitome of great things coming in small packages.” This perfect city break is packed with history, culture, rich food, and exciting events. 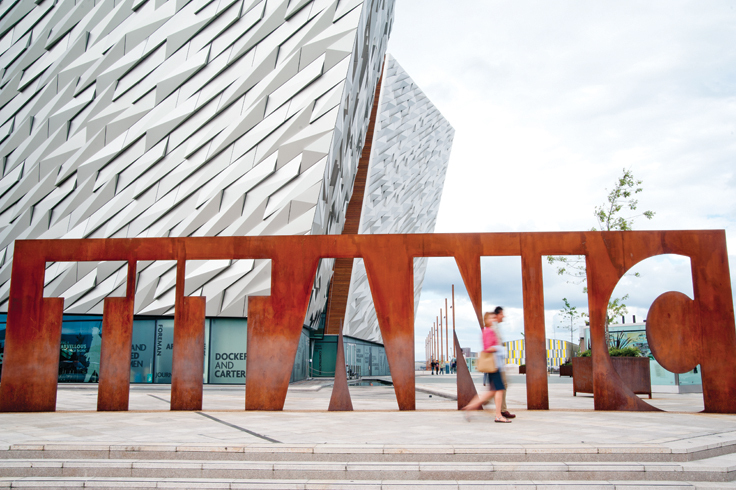 The home of the Titanic and the capital of Northern Ireland, Belfast is a destination not to be missed. Built on the slipways where the Titanic itself was constructed, visit Titanic Belfast, which isn’t just a museum, but an experience. Located in the heart of Belfast, just beside the Harland and Wolff shipyard, where the Titanic was designed, built and launched in 1912, Titanic Belfast’s six-story building has nine interactive galleries to give you the ultimate experience. A weekend in Belfast requires a visit to St. George’s Market. Built between 1890 and 1896, this market is one of Belfast’s oldest attractions. 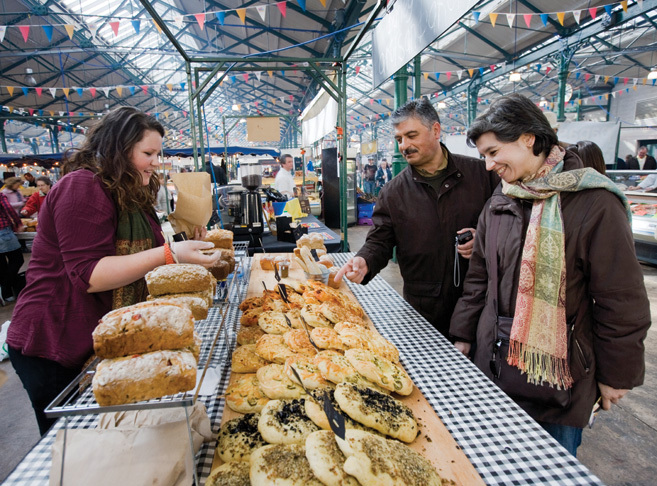 Open Friday to Sunday, the market offers some of the finest fresh produce and displays of local arts and crafts. The atmosphere here is always electric, with local musicians and bands showcasing their talents. 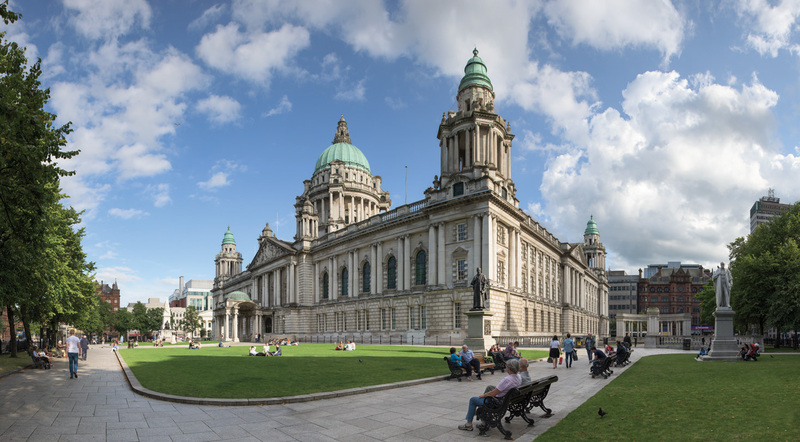 City Hall is another iconic fixture in Belfast. The exhibition stretches over 16 rooms and takes you from the city’s’ past to present. The collection of stained glass windows, original architecture, and historic memorials add to the singular experience of this particular attraction. 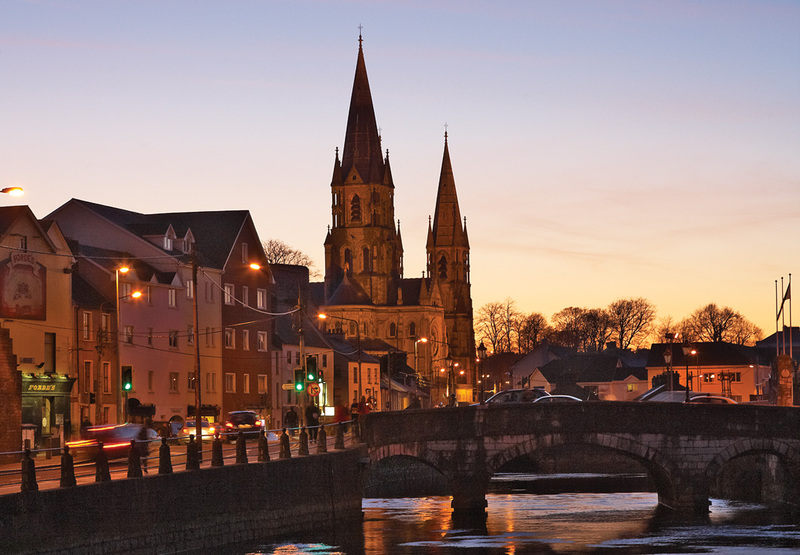 The River Lee and Saint Fin Barre’s Cathedral, Cork. Cork is a culturally rich, laid-back, and, best of all, accessible city in the southwest of Ireland. 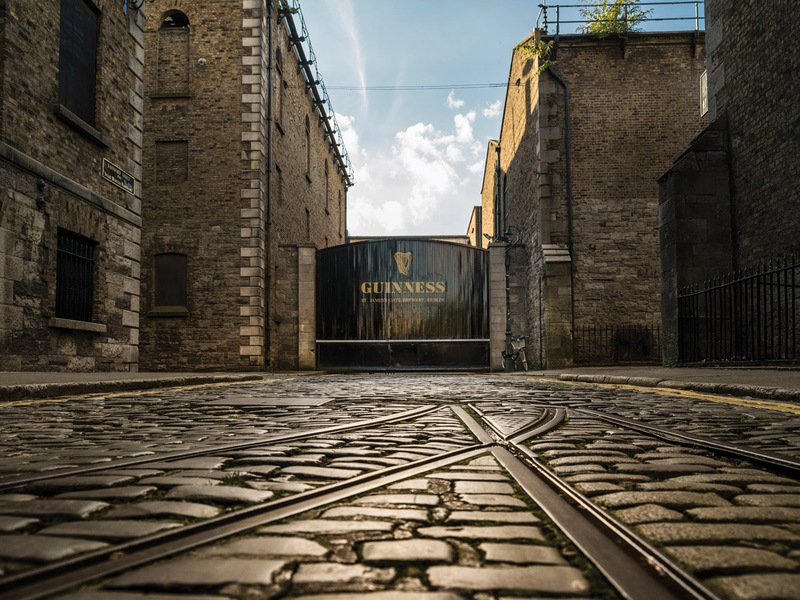 From the city’s multiple festivals every year to its unique craft beers and friendly locals, it’s a must visit stopping point during a stay in Ireland. Getting around is easy as the city center is easily walkable. And minutes outside the city, a landscape laced with beauty and history is waiting to be explored. 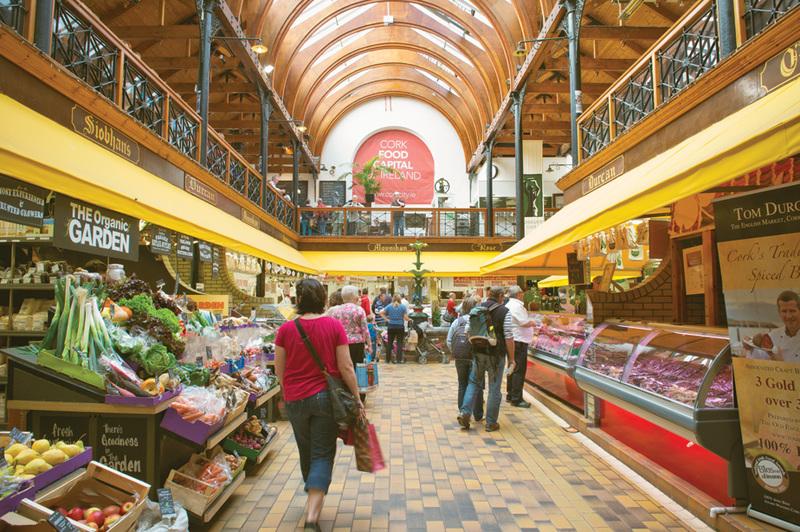 Any trip to Cork City is incomplete without stopping into one of Ireland’s most famous covered food markets. Situated in the heart of the city, the bustling English Market has been in existence since 1788. This thriving arcade has 55 stalls, where local traders sell high-quality, fresh produce. The smells that fill the air when you enter here will leave your mouth watering and have your stomach rumbling, so be sure to have a light bite in the upstairs café before you leave. If you enjoy discovering contemporary art, then you will love the Triskel Arts Centre. Cork’s principal visual and performing arts center is located in Christchurch, a beautiful 18th century building. With live performances, art exhibitions, unseen Irish movies, and more, Triskel Arts Centre is committed to providing quality art forms to suit every taste. 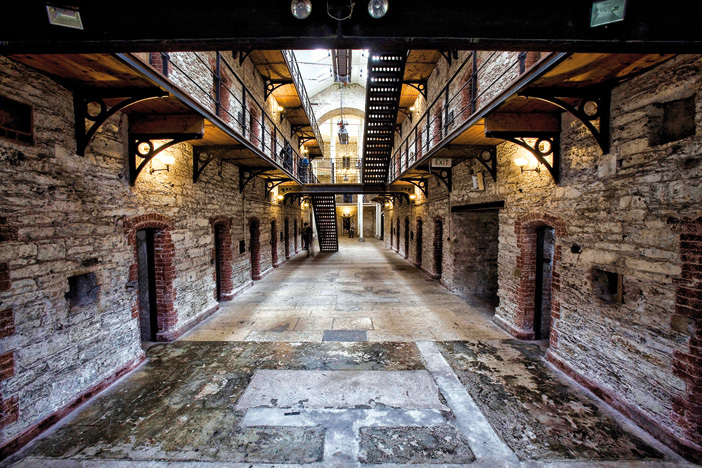 A short walk from the city center, and located within earshot of Cork’s famous Bells of Shandon, is a unique example of Gothic Revival architecture, previously home to the city’s prisoners until 1923 – otherwise known as Cork City Gaol. Take a trip back in time and wander. The life-like wax figures in furnished cells give the experience an extra realistic feel. 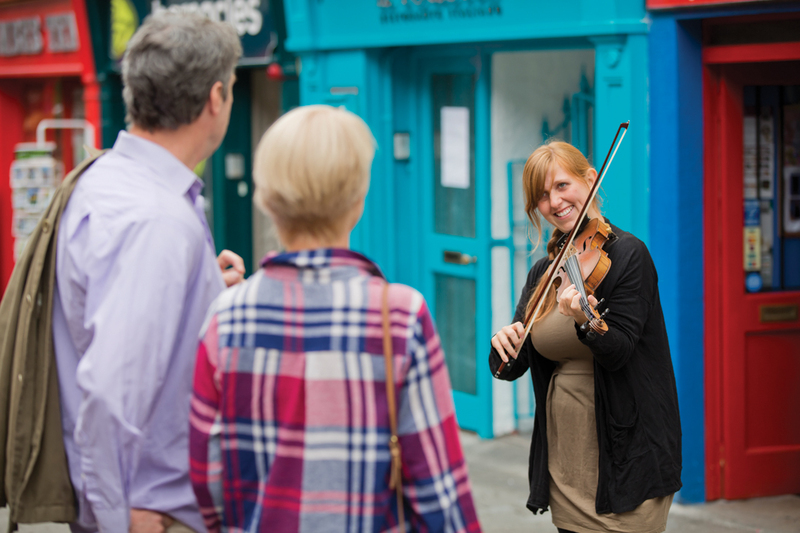 A busker in Galway City. A vibrant and creative city in the west of Ireland, Galway is a city you will want to make sure to soak up the atmosphere in during your trip to Ireland. 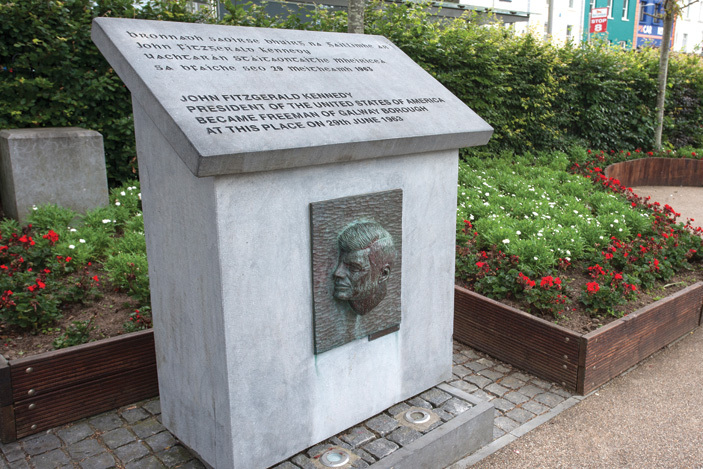 Take a stroll from Eyre Square, also known as John F. Kennedy Memorial Park, down the cobbled city streets. Pop in and out to local stores for authentic Irish gifts, while pausing to listen to the city’s special busking performances. It’s very common for people to breakout into dance on the streets to accompany the musical performers, so be sure to get those feet tapping and join in. JFK Memorial Statue, Eyre Square, Galway. 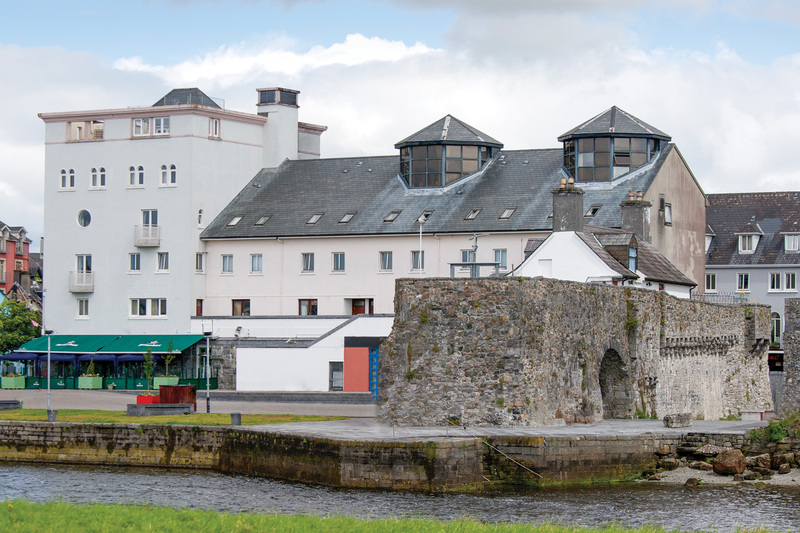 Built in 1584 overlooking the River Corrib, the Spanish Arch is an iconic landmark in Galway. The two arches that still stand today were an extension from the city wall as a means to protect from intruders or thieves coming in from the River Corrib. The Galway City Museum is located just behind the Spanish Arch. After a visit here, enjoy some fine local cuisine and a refreshing pint in one of the nearby pubs on Quay Street. The Spainsh Arch and quayside, Galway. Take a leisurely cruise sailing from the heart of the city onto Lake Corrib, the Irish Republic’s largest lake. The Corrib Princess is equipped for all types of weather and departs daily. This cruise offers incredible views of castles, wildlife, and the rich, green countryside. Enjoy a cocktail or an Irish coffee as you cruise around in comfort and luxury. The title of this very interesting article seems to suggest that Christmas is still called by its proper name it Ireland; it is not the holiday or the season. During the past several years, a party was held in mid-December by American by local American Legion posts at the Oxford Veterans Nursing Home (Chenango County), and this is called the Christmas Party.